Durga Puja starts on October 15, and we’re all set for some pandal-hopping. Here’s where to catch all the action in the city and of course, enjoy delish food like Alur Torkari, Sondesh, Begun Bhaja, Kolar Bora (yes, you’re probably salivating by now) and more such delicacies. One of the oldest pujos in the city, this is organised by the Delhi Durga Puja Charitable & Cultural Samiti every year (since 1910) in North Delhi. You can check out their website for the entire schedule. Take note, prasad and bhog will be available from 16th to 18th between 11am to 1.30pm. First held in 1991, Maruti Vihar hosts one of the oldest Durga pujas in Gurgaon. Easily accessible right off of MG Road, the puja draws thousands of visitors. They also call in artists from Kolkata. So, there's no doubt that the celebrations here will take place in true Bong spirit. CR Park during puja days has pandals at every corner, but the most prominent is the CR Park Kalibari. Since the temple has its own permanent mandap, it’s the perfect destination for those who want to take part in the dhunuchi naach. As CR Park is also known for its food, indulge in homemade aloo poshto, begun bhaja and maacher jhol made by the residents in their own kitchens. The Sushant Lok Durga Puja (held in the C Block, Community Center) is one of the youngest-yet-popular pujas in Gurgaon. We’re looking forward to the various naataks, singing and dancing programs they've planned this year along with a set-up delicious pujo dishes. Said to have one of the best pandals in Gurgaon, Bangya Parishad’s Durga Puja includes live performances, stalls, and a festive atmosphere like no other. You can find this opposite the More supermarket. The Matri Mandir Samiti will organise their 52nd Durga Puja celebrations in Safdarjung Enclave and we're stocked since it's not uncommon to see the pandal here, embellished with art and sometimes, artists are flown in all the way from Kolkata. In Mayur Vihar Phase 1, the Milani Puja Committee hosts grand Pujo celebrations with pandals that have the most unique themes.They’re also known for their stately pandals and the traditional evening aarti, which is as good as the ones you’d find in Kolkata. Head near Supreme Enclave Apartment to see this one. Expect artistic idols and theme-based pandals at Timarpur Durga Pujo, which has been celebrated here for the past 100 years. It’s where you’ll get the typical Kolkata vibe seeped in culture and art. What’s more, they still carry the idol of Ma Durga to the place of immersion on an illuminated cart as per ancient tradition. 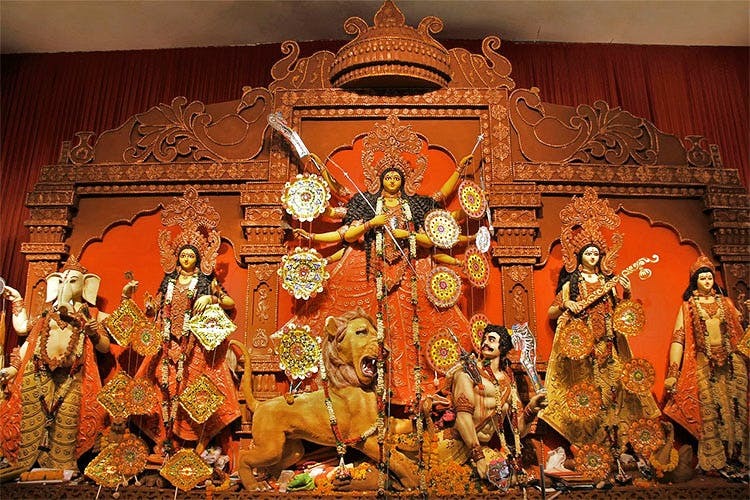 Organised by the Minto Road Puja Samiti, this pandal celebrates Durga Puja the Bonedi Pujo way (the way the affluent families of Kolkata used to celebrate in their houses). The Minto Road celebrations promise an experience at par with that. Check out their website for programme itinery.